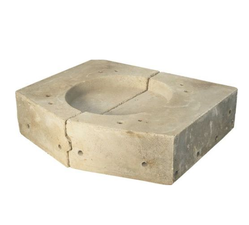 We manufacture complete crucible and supply all types of discrete components used to build a crucible of induction furnaces crucibles. We supply premium quality Water Cooled and Air Cooled Laminated Yoke to our esteemed clients. Yokes are made out of laminated CRGO sheets cut from prime materials as per its design and annealed for proper Grain orientation up to its required temperature. These laminated sheets are pressed with hydraulic press machine o0r by hand driven pressure machine to maintain its tightness so that a very minimum air gap between laminations exists for better result. 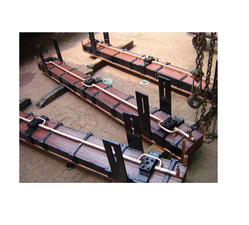 Yokes are made bolted or welded type with Copper plates for cooling purpose. Copper plates are placed between laminations or on the extreme sides as required to remove extra heat removed through water passes on brazed copper tubes on the plates. Yokes are mainly used to pass the huge electrical Coil fluxes, finds it a low resistance path for electrical fluxes.